A Savoury Cake Take three pounds of veal chopt fine, & two pounds of Beef suet chopt fine; season it with pepper, salt and spice, pound it well in a mortar, add to it the yolks of eight eggs, and two pounds of ham cut in dice, mix it well with a wooden spoon, put it in a round deep pan that will just hold it, and bake it one hour and a half in a moderate oven. you may serve it up hot with some cullis under it, or you may let it cool, and make a snail's house, &c by ornamenting it with butter and amulet. 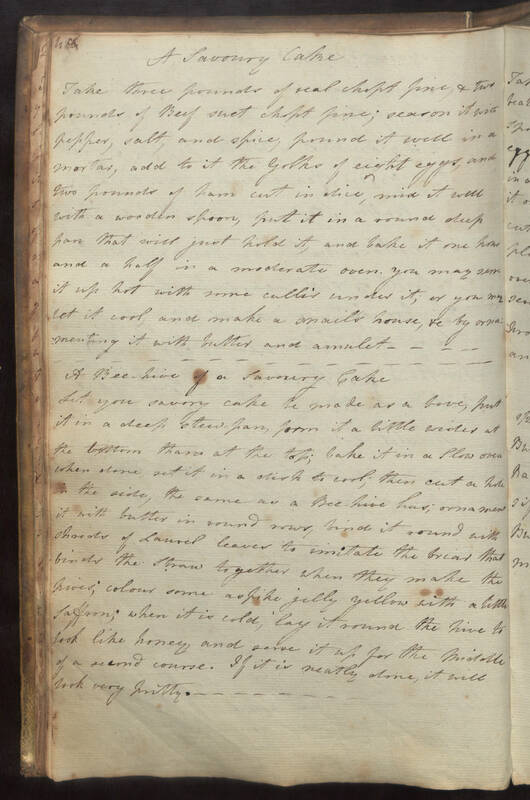 A Bee-hive of a Savoury Cake Let you savory cake be made as a bove, put it in a deep stew-pan, form it a little wider at the bottom than at the top; bake it in a slow oven when done, set it in a dish to cool; then cut a hole in the side, the same at a Bee-hive has; ornament it with butter in rounds rows, bind it round with shreds of Laurel leaves to imitate the briar that binds the straw together when they make the hives; colour some aspike jelly yellow with a little saffron; when it is cold, lay it round the hive to look like honey, and serve it up for the middle of a second course. If it is neatly done, it will look very pritty.